Posted on Mon, Jan 23, 2012 : 5:47 a.m.
Ryan Adams plays the Ann Arbor Folk Festival on Friday. It might be tempting to lump Ryan Adams in with a slew of other sensitive-sounding male singer-songwriters who are popular these days—Jack Johnson, Pete Yorn and Jeff Tweedy, to name just a few. Adams may have a bit more grit than some, however. One of his earliest bands was the punk rock group Patty Duke Collective, a genre he pretty much abandoned with the founding of the critically praised alt-country group Whiskeytown in 1994. He’s also fought his way back from some hard-partying early years as well as from a recent illness considered particularly cruel to musicians. Adams will headline the Friday night session of the Ann Arbor Folk Festival, the night usually reserved for artists more on the cutting edge of what’s considered folk music. Adams is compelling “because he’s an artist that has taken risks with his music and delved into so many areas with his art,” said Barb Chaffer Authier, marketing director at The Ark, which presents the festival as a major fund-raiser. The prolific Adams, considered one of alt-country's top performers, has been nominated for Grammy awards more than once, and has more than 20 albums to his credit. Whiskeytown lasted until 2000, after which Adams pursued other projects, including The Cardinals (2004-2009) and a solo career. In 2000 he released the album “Heartbreaker.” The follow-up CD, “Gold,” came out in 2001, and a music video for the song “New York New York”, which showed the singer performing in front of the Big Apple’s skyline just a few days before the Sept. 11 attack, received huge airplay, helping introduce him to broader audiences. Who: Alt-country from this former member of Whiskeytown. Also on the bill: Devotchka, Dawes, Carbon Leaf, Elephant Revival, Sunny War and David Wax Museum. Heywood Banks hosts. What: Ann Arbor Folk Festival, night one, presenting artists more on the younger, cutting edge of folk. When: 6 p.m. (doors) Friday. How much: $160-$35. Tickets available by phone at 763-TKTS or in person at the Michigan Union Ticket Office, Herb David Guitar Studio, The Ark box office, or on line at www.mutotix.com. He took an enforced hiatus from music in 2009, after being diagnosed with Meniere's disease, an inflammation of the inner ear that can cause nausea, dizziness and tinnitus. He moved from New York to Los Angeles, quit drinking and smoking, and sought alternative therapies, including acupuncture and hypnosis. With the disease now under control, his break ended last year with the release of the new album. "I wanted it to musically and sonically feel like the feeling you get when you're overheated in a car," Adams told National Public Radio. "You're driving someplace in the summer, and the windows are down—but it's still very warm. I think somehow the idea ended up permeating into the themes of the songs." He also talked about one of the unusual ways he finds inspiration for his songs. “There’s this game that I play with myself called ‘stacks,” he explained. “There’s a bunch of books on the left and a bunch of books on the right and there’s me in the middle with my feelings. I read lines from books on the left and I read lines from books on the right until something strikes an emotional chord in me. He acknowledged that his life was veering out of control prior to the Meniere's diagnosis, but said he feels like he’s on an even keel now. As is typical with the Folk Festival, headlining acts come on near the end of the program, so don’t expect Adams to take the stage much before 10 p.m. There’s plenty of good music leading up to his appearance, however, including Denver indie band Devotachka (which scored the 2006 multi-Oscar-winning film “Little Miss Sunshine”) and folk-rockers Carbon Leaf (hitmakers with “Life Less Ordinary”), who were just at The Ark last September. 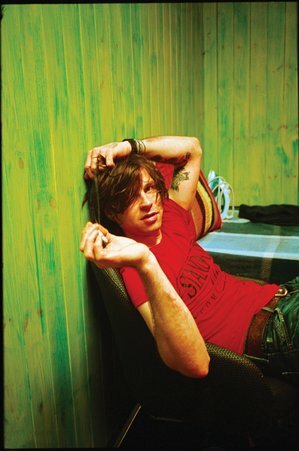 Mon, Jan 23, 2012 : 1:27 p.m.
Ryan Adams is eclectic, interesting and talented. How else can you explain the fact that Phil Lesh of The Grateful Dead covers Ryan's original music and vice versa. Prolific.